Take Your “Suite” Away to Dreams Resorts & Spas! 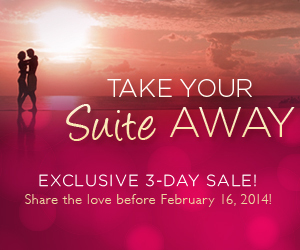 It is time to Take Your “Suite” Away to Dreams Resorts & Spas! Show your sweetheart just how much you care when you take advantage of our great rates at either Dreams Puerto Aventuras Resort & Spa or Dreams Villamagna Nuevo Vallarta! Your sweetie will have it all and we can’t wait to shower you in Unlimited-Luxury® amenities including a welcome cocktails, premium brand drinks, 24-hour room service and more! This entry was posted in Dreams Puerto Aventuras, Dreams Resorts & Spas, Dreams Villamagna and tagged Promotion, sales. Bookmark the permalink.